Are you still thankful for all those Thanksgiving leftovers or are too stuffed to eat one more bite of pie? We are beginning the Holiday season when healthy eating gets thrown out with unwanted turkey parts. To continue our discussion of memory treats and as I’ve mentioned before, being mindful of what you feed your brain and body matters. It matters a lot. I am a firm believer of everything in moderation. I ate pie, stuffing and rich foods last weekend and will eat more over the next four weeks. But what I’ll also do is think and plan very carefully how I will fit in additional exercise and smaller, healthy meals to balance all those indulgences. Celebrations and holidays are about just that-special celebrations for special holidays that only come once a year. We should eat those loved foods and celebrate. It isn’t about only eating healthy foods. But it also isn’t about throwing common sense and our focus on wellness out the window either. Maintain or even increase your water intake. Winter for many of us is dehydrating to our skin, body and also those brain cells. A glass of water before each meal will cut your hunger and allow you to indulge in smaller amounts without missing a morsel. Maintain or even increase your exercise. Exercise will keep your brain functioning optimally to make wise decisions about so many things including what and how much you eat. Bonus-it keeps your memory sharp! 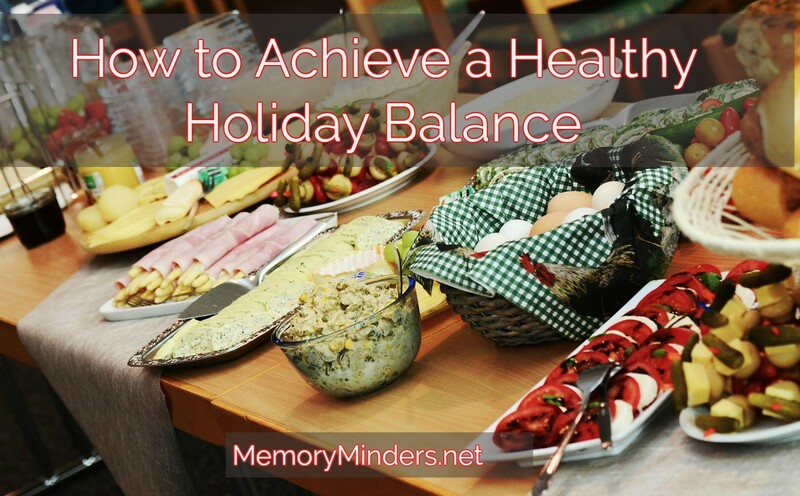 Insert brain healthy fruits and veggies into appetizers, snacks and drinks you’ll be eating or drinking anyway. I whipped up a cranberry orange tart, a beet and goat cheese appetizer and a cranberry pomegranate cocktail last weekend with great results! Insert healthy meals in between the celebratory indulgences. Go meatless or add more salmon or tuna in between the meat-centered meals. Maybe the weekdays are all about eating smaller, healthy meals to allow for a bit more indulgences on the weekends. Remember: everything in moderation. No one needs three trips to the buffet. Pay attention to choose well and choose wisely! 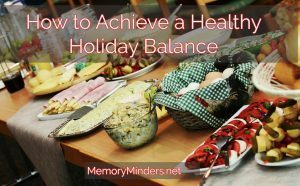 We all will remember the holidays in a healthy way if we remember to pay attention. We will not only create more memorable moments but also be healthier in the process! P.S. Still thinking about what gift to get for an older friend or family member? Our Academy mental fitness subscription is the perfect gift to help anyone stimulate their minds and memories AND it’s on sale! See here or contact me for further details! *Please always adhere to any diet your physician has prescribed for specific medical reasons.